While aging is inevitable, giving in to its wrinkles, lines, and creases isn’t! While some patients at our San Diego practice opt for surgical procedures such as facelifts, others prefer nonsurgical options such as dermal fillers and other injectables. Dr. Kearney is well versed in what each injectable can and cannot do to rejuvenate your face. Botox is an injectable that temporarily reduces the appearance of lines and wrinkles on the face by stopping the muscle contractions that create them. It is specifically injected into deep grooves along the forehead or around the corners of the eyes. Juvederm is a hyaluronic acid face filler used to plump the lips and fill in lines around the lips or the nasolabial fold that runs from the nose to the mouth. Since it is made of hyaluronic acid, a substance naturally created in the human body, there is no need for allergy testing. Juvederm treatments are performed in Dr. Kearney’s office. A topical anesthetic may be used before injection of this dermal filler, yet most of our patients don’t opt for it. Patients resume normal activities immediately after treatment. The results of Juvederm dermal fillers usually last six months to a year, depending on the areas treated. A member of the Juvederm family of products, Volbella XC is an FDA-approved injection used to increase lip fullness and soften the appearance of “smoker’s lines” around the mouth. It may also be used to fill pitted acne scarring in the face. Unlike other fillers, Volbella blends different molecular weights of hyaluronic acid, which allows it to create a subtle volume that lasts for up to a year. You may be a candidate for Juvederm Voluma if you have lost volume in your cheek area. As we age our cheeks start to lose volume and skin begins to sag. Juvederm Voluma is the first and only FDA-approved injectable gel that instantly adds volume to your cheek area to correct age-related volume loss. It can provide you contour and a subtle lift for up to two years. Kybella is a non-surgical dermal filler used to improve the appearance of moderate to severe fullness in the upper neck area, also called the “double-chin”. It works by dissolving the fat cells in this area, improving contour. 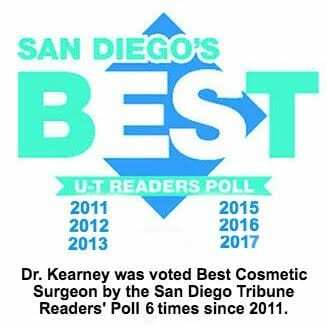 Dr. Kearney will be able to determine how many dermal fillers are needed during the consultation. Many patients notice significant improvement after just one treatment and begin to see results about 3-4 weeks after the treatment. Side effects can include swelling, bruising, numbness and temporary hardness in the area injected. Sculptra is a Poly-l-lactic acid injectable that restores facial volume and corrects facial fat loss. Specifically, it is injected into sunken cheeks. Skin testing is not needed prior to injections. There is no downtime with Sculptra dermal fillers. Dysport is a facial filler that reduces the appearance of lines along the forehead and around the corners of the eyes (crow’s feet). Dr. Kearney administers these dermal fillers in the office. Anesthesia is not required and there is no downtime. Effects are usually seen three to four days after treatment and result last from three to five months. Restylane is a hyaluronic acid face filler that is injected into the lines that run from the nose to the mouth or lines that surround the lips. It is also recommended for those who want to have fuller lips. Like Juvederm, allergy testing is not needed prior to injections. Anesthesia is not usually needed and patients can immediately return to typical activities. Depending on the areas treated, results are visible for up to six months. Bellafill® uses an innovative blend of two distinct components to create results that are both immediate and long-lasting. Suspended within its smooth collagen gel base are tiny polymethyl methacrylate (PMMA) microspheres. Once Bellafill® is injected, the collagen goes to work immediately, adding natural-looking volume to soften smile lines or acne scars. For more information on dermal fillers and injectables or to schedule your first appointment, contact our San Diego area office at (858) 677-9352.